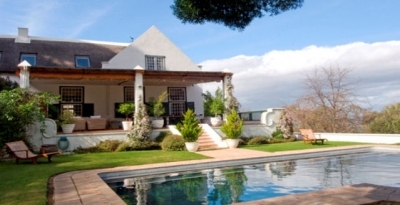 Villa Steenhuis is an exceptional property of ambassadorial proportions located in the most prestigious suburb, Upper Constantia in Cape Town, for the very discerning visitor. Here one can experience the luxury and elegance of a unique estate where you will be more than merely accommodated. The peaceful country atmosphere of this splendid region is balanced with the grand elegance and old-world charm of the mansion. Situated in the heartland of the 'Constantia Valley Wine Route', where vines were first planted in 1685, Steenhuis Estate is ideal to explore the many fascinating offerings of the Cape. The dramatic background of the mountains, the expanse of the vineyards and the spectacular views of the sea, offer world-class serenity from where you may explore and enjoy this most prized area. Steenhuis offers you more than mere accommodation. Rather it offers total privacy, comfort, freedom, peace and tranquility. The Colonial Cape Dutch styled residence is an entertainer's paradise of the grandest proportions and is fully equipped with all the modern conveniences and serviced with daily housekeeping. The home also provides state of the art security systems, a garden cottage, swimming pool, tennis court, Koi pond and four acres of manicured garden. Our management will be more than willing to accommodate any special requests that you may have from a chauffeur to a personal chef so that your vacation remains comfortable and relaxed.